I love doing video and my clients seem to like what I do for them. It's the most successful part of my work...but right behind it comes Wikis. People just can't get enough of them. 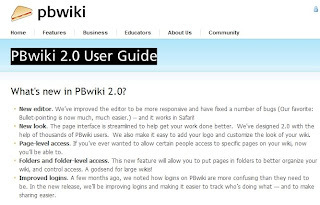 I've been using PBWiki for a couple of years now, and it's really taken off for me. I use it for government clients like LA County, and I use it for my friends like Tai Chi teacher Jennifer Hill and of course for my LA Leggers pals. I also use it for project tracking and project development. It's a great place to organize everything large and small...your most fleeting and tiny ideas all the way up to your next Major Motion Picture. Examples here are Top Secret...but I can say that it works very well for collaborations. As a long-time user I was given a chance to Beta test 2.0 (now in general release), and it is deluxe. I've just begun to scratch the surface, but I know I'll be building more with PBWiki. Hats off to one of my unions (!) -- The Freelancers Union. They are starting a membership drive this month & in support I've added the button at left. I think this group is filling a critical void in today's workplace: where else can the 1099er go for insurance, business and tax advice, networking...even advocacy? Drop by the Freelancers Union Site to see what they are up to.